I might count this as a historical novel. Well, a pulp novel from history. The cover says Tarzan is perhaps the most famous character this extraordinary writer ever created, but I know Burroughs mostly for John Carter, the Warlord of Mars. Tarzan has gotten quite the screen time, though, hasn’t he? I remember the television program that KPLR ran on Saturday mornings before its movie triple feature. Remember when independent stations ran those? At any rate, this book follows the plight of Tarzan’s parents, the Lord and Lady Greystoke, marooned on the African coast, the raising of Tarzan, his growth and eventual ascendance among the apes, and the arrival of other maroonees at the same spot. There, Tarzan saves Jane, and the hearty French (!) rescue Jane and her family. Tarzan then, in the final bit of the book, goes to civilization and ultimately Wisconsin (!) to save Jane again, but ultimately lets her wed his cousin who has assumed the title Lord Greystoke. The end bit runs very quickly (quicker since it’s missing 6 pages of the climax). Taking Tarzan out of the jungle ultimately doesn’t work, but I bet others in the series will return him to the wild. I bought a number of them at a recent book fair and left some of them unpacked, so I imagine I’ll read it in the next month. All the cool kids, and by that I mean Kim du Toit (PBUH), love the Flashman novels. So when I lit upon one for a couple bits at a book fair, I bit. You know if you’ve been reading here any length of time (and don’t skip the book reports) that I’ve been reading historical novels, particularly the Sharpe series, so I have to draw a quick contrast between the two. Unfortunately, this book and probably series might fall short. In this book, a ne’er-do-well aristocratic prodigal son gets thrown out of school (apparently, the books take off of a bully and boor from another British series of schoolboy books), gets his colors, and ends up getting sent to India and Afghanistan as an officer. He gets reknown and reputation for surviving massacres simply because he runs away, lies, and does disreputable things. I kept hoping for some sort of redemptive moment, but at the ending of the book, he finds his wife has been cheating on him while he was away and accepts it because her family has become his family’s meal ticket. I guess the books were written at different times, which might explain the differences. Fraser’s book came at a time when it was radical to puncture the sense of pride Britain had in its empire; Sharpe’s books, where Sharpe starts out sort of a Flashman sort but with comraderie, kinship, and some patriotism, actually prop up the traditional notions instead of knock them down. Hence, I enjoy the Sharpe books better for the thematic treatment. I didn’t enjoy this book, ultimately, and I’m not going looking for another in the series. To say I won’t read one, though, might be going a bit far. Perhaps I’m optimistic enough to hope for some redemption somewhere. RI highway trooper delivers baby in pickup truck. he other storefronts surrounding the building on West Eighth Avenue and Santa Fe Drive in downtown Denver’s art district were untouched. But the Democratic posters are scuffed from hammer blows, Waak said. No doubt if he had gone into the building, he would have damaged the upholstery with a sickle. British government plans to curb alcohol-fuelled violence by introducing plastic beer glasses in pubs are unlikely to be popular, the pub industry warned on Monday. The Home Office (Interior Ministry) has commissioned a new design for plastic containers in an attempt to stop glasses being used as weapons, reports said. The plan is in response to official figures showing that 5 500 people are attacked with glasses and bottles every year in England and Wales. You see, you cannot prevent violent people from violent acts by outlawing objects. You just limit the liberty of the law-abiding. Outlaw guns, the violent use knives and swords. Outlaw knives and swords, the violent use bottles and beer mugs. Outlaw bottles and beer mugs, what’s next? Mandatory manicures and compulsory participation in the British NHS dental system? Wait…. The Missouri Court of Appeals, including the vigorously pro-city Judge Thomas Gantt, eventually affirmed the tossing of 5,068 ballots, most of them “no” votes, for an overall victory margin of 1,253. The city declared itself independent in March 1877, and the courthouse crowd conceded. No doubt, back in the old days, the St. Louis Post and the St. Louis Dispatch both favored the plan, but now that it’s a hundred and thirty years later, the city and its cheerleading section (the Post-Dispatch) want to cast a pall over an election to delegitimize it. Don’t worry, the city tells the county. For all the bad things the county has done, the city will take it and its tax base back. “We are God’s partners in matters of life and death,” Obama went on to say, according to Moline’s real-time stream. If President Obama were indeed born in Hawaii, was it while the islands were a territory of the United States? A new wrinkle in the dispute over his birth – and whether he is eligible to be president under the U.S. Constitution’s requirement that the president be a “natural born” citizen – appeared today when Obama’s official MySpace page declared his age is 52, thus placing his birth year at 1957 instead of 1961 as has been claimed. That would mean he would have been born during the archipelago’s time as a territory of the U.S., the islands’ status from about 1900 until statehood in 1959. President Barack Obama obviously was born in 1961 and turned 50 in 2011, at which time he saw the disaster that befell a United States where he was not President, including the complete collapse of the health care system, ocean levels rising, a democratically-elected and Constitutionally sound government in Honduras, and a vibrant used automobile market. Once he saw this, he traveled back in time to 2006, got elected to Senate, and began his world-saving run for the presidency in time to avert catastrophe. That’s Occam’s Razor applied liberally. It’s similar to a Googlebomb or a Googlewhack, but it’s this: when someone tries to find a set of search terms to use to conduct a Google search that will link to a certain blog so that you can see if your search terms appear in that blog’s round-up of weird search engine queries. Search for betty naked with Mr Weatherbee. Click through on the Dustbury link. Watch for your search terms to appear in one of his Strange Search Engine Queries posts. Other blogs to try this with include Munchkin Wrangler and View from the Porch. I know, you think I have too much time on my hands. The problem is that I don’t have enough time on my hands to do anything productive. Instead, I have just enough time to come up with harebrained schemes like this. I read this book right after the Gates thing and right after a conversation on race that pretty much ended with my black friend saying, “You’re not black, so you can’t understand and you’re wrong.” Maybe this book was penance. Or maybe it’s because it was the first Mosley book I saw at a book fair after I read Transgressions. Pick whichever you want to fit into your narrative of Brian. This book is later in the Easy Rawlins canon, and it fits into the mold of good hard-boiled detective fiction. Rawlins helps a friend by finding what his wife’s child, the titular Brawly Brown, is into. He peels away the layers and finds that the young man is indeed in over his head in something bad and he has to go to extraordinary means to extract him (in a fashion). That said, the retro feel of it, the strange lingo, and a certain alienation of the reader from the argot of the story keeps with what one encounters reading the oldies today. However, Mosley pulls the white reader out a little with continued that’s what it’s like to be black asides. The situations Rawlins encounters aren’t that much different from the things encountered by the regular private eye, but the first person narrator dwells upon his blackness an awful lot. I don’t dwell on my race that much, so that’s very alien to me. I’m not sure if it’s authentic or not, either, but if it is, that’s a real tragedy. Still, I liked the book enough to not shirk other Mosley books in the future. I read the first book in this series (Sharpe’s Tiger) earlier this year, and nobody saw fit to fill in the gaps in the series for my birthday, so here I am reading the second book. In this book, Sargeant Sharpe is the sole survivor of a massacre by a treasonous English major. Colonel McCandless takes Sharpe to try to capture the traitor and bring him to justice as English forces march to fight the armies of Northern India. A good collection of details and episodes based on real history. One thing between reading this book and Space Vulture is how much more detailed modern books are. The old ones provided some sketches and a fast moving plot, but the books these days really lay on the detail. I don’t know, it can take the book out of your imagination a bit and shoehorn it into the author’s. Not that this book is that bad, per se, but I think it’s a general evolution of the common style. I blame Faulkner. One of the more interesting things about this story is the authors. Childhood friends in the 1950s in Illinois, they went onto different things. One wrote the story that became Who Framed Roger Rabbit?. The other became an archbishop. They got together and wrote a book that would hearken back to the sci-fi space operas they loved as kids. It’s such a neat story, it appears on the back instead of anything of the plot. Probably because it’s the sort of thing that hearkens back to fifties space operas. The book follows the takedown of the Space Vulture, a criminal genius whose exploits are legendary. Opposing him are the reknowned bounty hunter Victor Corsaire; Gil Terry, a small grifter who was briefly in the custody of Corsaire; Cali, the widowed administrator of a planet raided by Terry and later, more successfully, by the Space Vulture; and Eliot and Regin, Cali’s two plucky young sons who are left behind. In a series of reversals and cliffhangers, the foes gyrate about each other and finally meet for the climactic battle on a slaver planet. The book walks the line between earnest and campy, staying pretty earnest. The style mimics serials a bit, complete with an ending that indicates another adventure will be available next week. And, with an archbishop co-author, we get prayers and peace in the face of death that you don’t normally see in science fiction, but these are really just flourishes and asides, so religious belief is not core to the story. Overall, a pleasant reading experience. Roddy MacDowall on Planet of the Apes (the television series). Looking at that list, I have only seen 3 or 4 of the series; most were not even in syndication from the time I remember watching television. Some I remember from other roles. Some I know of only because his son starred in the classic film Wing Commander. Each little snippet tells a heartwarming story about the actor/actress, the causes he/she favors, and the hard road to stardom. At this snapshot moment in time, these celebrities are at the top of their games and, in many cases, their careers. 35 years later, we don’t remember most of them. Sadly, ten years after the book appeared, we didn’t remember most of them. This fits in well with the stoic works of Marcus Aurelius, which warns about the fleeting nature of fame. Using area movement, Risk ignores limitations such as the vast size of the world and the logistics of long campaigns. So you mean I’ll need a navy to invade Iceland? There goes my weekend plans. Anyone want to go catch GI Joe instead? 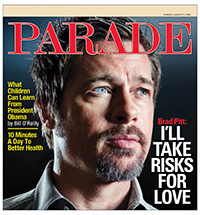 Brad Pitt will take risks for love. Seriously? Take risks for something of value? You don’t say. I think it would be more revealing to say Brad Pitt takes risks because he’s celebrity-insular and reckless. Unless they mean Brad Pitt shoplifts at Toys ‘R’ Us and stuffs Parker Brothers games under the baby blankets of his adopted hordes. That would mean taking Risks in a way that would be interesting. But it’s good to know that Brad Risk, for love, is not afraid to look like Jonathan Frakes for love. A Michigan family is losing its home because it underpaid the mortgage by 7 cents in January, a legal aid group says. Rooks said [redacted] of Deckerville, in the Thumb, inadvertently underpaid their mortgage because a postal clerk issued a money order for $440 rather than $440.07. The couple didn’t catch the mistake and they were four weeks late making February’s payment of $690.07. She said they had been late before. Though the Bergers caught up by mid-April, Rooks said, Countrywide Financial and its new owner, Bank of America, rejected the couple’s payments. Bank of America countered that it and earlier loan servicers bent over backward to accommodate [redacted], who has been repeatedly delinquent since purchasing the modest four-bedroom frame bungalow for $38,650 in 1997. It said [redacted] rejected a reasonable offer last week to get reinstated. Those allegations by the people who know and who own the paper mean nothing; the paper and its wire service have their hook and story. It was the seven cents, and that illustrates how capricious and darewesay evil companies are. Only the benevolent government and its press corps can save the people. Normally you lose when you bring a knife to a gunfight, but not Ramiro Silva. The gunman stuffed the shotgun into a bag and ran into the woods and Mr. Silva grabbed his machete, a fearsome looking blade, and went in after him. Silva wacked the suspect with the sword, using the face not the blade. Knife, machete, sword…. All the same to the kids writing news these days. I suppose we should just be glad that it wasn’t called an assault blade. Dying is cost-effective when you’re just a number in parentheses on the government ledger. So, if you’re a reporter, is every single discharge of a firearm “gunning down” now? A 51-year-old man who gunned down at least three squirrels from inside his home near N. Teutonia and W. Custer avenues Sunday surrendered to officers after the Milwaukee Police Department’s tactical squad was called to the scene. When I was a young man, this was called feeding your poor family. I wonder why the reporters didn’t bother calling the .22 an assault weapon. Hey, who knew that the Rams built in an escape clause in their contract? The Rams wouldn’t have moved to St. Louis from Southern California without the existence of the TWA Dome and its lucrative lease. The franchise’s move to the Midwest led to a second wave of relocation in the NFL, and sparked an unprecedented boom in stadium construction throughout the league. And if the Rams could move from the nation’s second-largest market to a mid-level market in the Midwest, it could happen anywhere. Owners wanted to keep up with the revenue stream that a new stadium produced; cities worried about losing their team if they didn’t have a new stadium. One new stadium after another sprung up around the league. Jerry Jones’ new $1.12 billion playpen in suburban Dallas opens next month. In 2010, when the New York Giants and Jets move into a $1.6 billion stadium, 22 of the 31 other NFL teams will be playing in new or massively renovated stadiums that were built after the St. Louis dome opened in ’95. All of this might be of only marginal interest to the Rams — and to St. Louis — were it not for the “first tier” provisions of the relocation and lease agreement negotiated between the Rams and the CVC in 1994 and ’95. The first-tier provisions were the work of Shaw and are the envy of just about every other team owner in the NFL. Huh, who could have known about the provision that the football team could break its lease if the stadium wasn’t one of the top ones in the league? Only opponents of the public funding of the stadium in 1995. I’ve snickered about it myself for over a decade now, pointing out that they could either hold the city up for more or take off. So what are the first-tier provisions and the mechanisms that could lead to the departure of the Rams? The Post-Dispatch obtained a copy of the 1,700-page lease and relocation agreement from the CVC and with the help of a local attorney sorted out the first-tier language. You know, perhaps if you’d read some opposition work from 1995, you’d have already known that. But the St. Louis paper’s institutional memory is shorter than most, what with turnover of reporters, editors, and ownership since then. Hey, an inscrutable, thousand plus page document being waved in front of the people as a triumph without comprehension or attention? What does that remind you of? The bottom line on the American health care system is that it makes absolutely no sense. No one — not conservatives or liberals, doctors or patients, businessmen or humanitarians — would design such a system starting from scratch. It’s paradoxical, pricey and porous. If President Barack Obama has his way, it’s about to get a significant overhaul. Senate Democrats already have released several draft proposals that they hope will expand insurance coverage and control costs. That’s no mean feat. Even many who wish them well doubt that it’s possible. In both cases, the paper will cheerlead the passage of something it only understands at a high level, and when the time comes and all the bad things shake out, it will run stories to gin up more. In the case of the Rams, it will be more government money to improve the stadium and keep the underperforming, underloved team here. In the case of a government health system, it will be more control or more money or maybe all of the above. I hope I don’t prove right in 15 years.